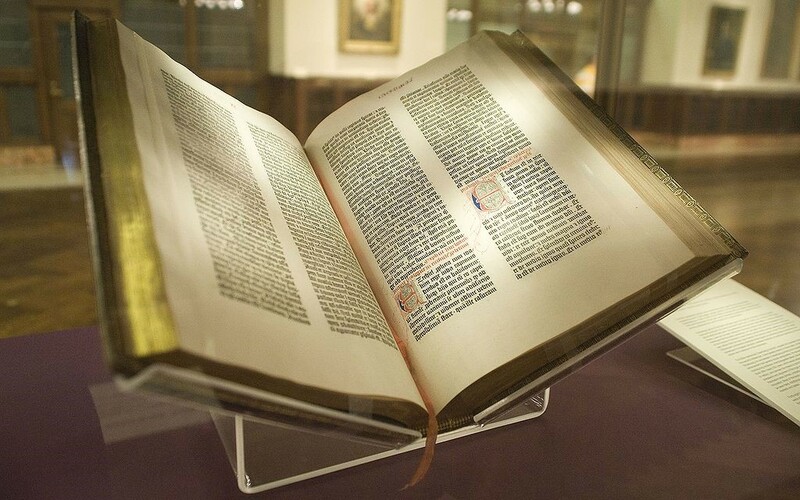 Gutenberg Bible, New York Public Library (photo by Kevin Eng, via Wikipedia). God is the author of Sacred Scripture…. The focus here, then, is on the sola, the word “only,” in the Reformation slogan sola scriptura. Like all words and especially all slogans, this one can be misunderstood, so let’s be clear about what it doesn’t mean. First, sola scriptura does not mean that the Bible is all Christians need to be saved or to live a faithful Christian life. “Me and my Bible” is not a complete picture of the Christian life. More than anything, what I need to be saved and to live a life pleasing to God is Jesus Christ. “Jesus and me” isn’t a complete picture of the Christian life, either, but at least it would express the right priority. In addition to Christ’s saving work on my behalf, I need the Holy Spirit, the Bible, prayer, and so on. I also need the church for many purposes. I need to hear the gospel, and that happens through the witness of people who are part of the church. I need to participate in corporate worship of God. I need the encouragement of fellowship with other believers. I need to be instructed, exhorted, challenged, rebuked, and comforted by other Christians, including Christian leaders to whom I am accountable. Sola scriptura does not deny or diminish the importance of any of these things. Wherefore we do not despise the interpretations of the holy Greek and Latin fathers, nor reject their disputations and treatises as far as they agree with the Scriptures; but we do modestly dissent from them when they are found to set down things differing from, or altogether contrary to, the Scriptures. Neither do we think that we do them any wrong in this matter; seeing that they all, with one consent, will not have their writings matched with the Canonical Scriptures, but bid us allow of them so far forth as they either agree with them or disagree. And in the same order we also place the decrees and canons of councils. So what does sola scriptura mean and why should Christians accept it? Let me answer this question by explaining and defending three points: the basis, meaning, and significance of the sola. First, the basis of the sola: Scripture is the only verbal word of God available or accessible to the church. There are two parts to the argument here. (A) Scripture is the only written word of God available to us today. (B) We have no human beings living on the earth today whose oral teachings are the word of God. (A) That Scripture is the only written word of God is really true by definition: whatever is the written word of God is by definition Scripture, and whatever extant, available texts that are the word of God are and should be recognized as Scripture by the church. Other written materials accessible to us may be true, uplifting, faithful, and valuable, but they are not the word of God and therefore are not Scripture. What makes Scripture unique, what makes it stand apart, is that it is the only written word of God in the church’s possession. Christ and the authors of the New Testament affirmed this unique character of Scripture in many ways. In numerous places they attribute the very words of Scripture to God as his word. Jesus, for example, refers to Scripture as “the word of God” in Mark 7:13 and John 10:34-35. (B) Catholic and Orthodox Christians generally agree with evangelicals that we have no human beings living on the earth today whose oral or written teachings are the word of God. In other words, we don’t have living prophets and apostles. Again, in a discussion with Mormons this claim would be a focal point of disagreement, but it isn’t with most non-evangelical Christians.6 Neither the Orthodox Church nor the Catholic Church claims that its leaders are prophets and apostles whose speeches or writings carry the same authority as those of the New Testament apostles of Christ. Apostles were individuals who had personally seen and heard the risen Christ (Acts 1:21-25; 1 Cor. 9:1) and who had received their commission directly from Christ, as Paul emphasizes he had (Gal. 1:1, 11-12). Paul says that the church was built on the foundation of the apostles and prophets, with Christ Jesus himself as the church’s cornerstone (Eph. 2:20). That term “foundation” is a metaphor picturing the apostles in their unique, unrepeatable role as the first-generation, founding members and witnesses of the church. I mean no disrespect to any Christian leaders living today, but none of them can claim to be an apostle or prophet. None of them can claim that his teaching is the word of God. This is why I included the word “today” in my definition of sola scriptura: Scripture is the only infallible rule of doctrine and practice for Christians today. The biblical arguments that non-Protestants often use to establish an oral tradition distinct from the written word of God in Scripture fail because the biblical texts they cite are not referring to an oral communication available to us today. Take, for example, Paul’s statement in 2 Thessalonians 2:15, “So then, brothers, stand firm and hold to the traditions that you were taught by us, either by our spoken word or by our letter.” Only by ripping this text out of its context can it be imagined to support the idea of an authoritative oral tradition existing in the 21st century that is distinct from the written word of God in Scripture. Paul is saying that the Thessalonians should hold on to the apostles’ teaching whether they received it orally in person or in writing in the form of an epistle. If we had audio recordings of the apostles’ teachings those could function as authoritative alongside the epistles, but we don’t. If we want to know what the apostles taught, we can find out only (there’s that word again) through the writings they left behind in the New Testament. If we have no oral word of God available to us today, and Scripture is all of the written word of God available to us today, then only Scripture is the verbal word of God available to us today. And this is really the whole basis of sola scriptura. The doctrine of sola scriptura is really an appeal to Christians to look to God alone as the final, infallible authority for the church. If I may put it this way, sola scriptura is really based on solus deus, God alone. It means that God is the sole infallible authority. God is infallible, and what God says—his word—is infallible. No other verbal communication or material available to us has this character of being the absolutely trustworthy, infallible, word of God. Creeds, for example, may be admirable, noble, and even faithful statements, but they are not the word of God. The church may and should learn by them and be guided by the early creeds that simply expressed the rule of faith that epitomized the teachings of the apostles that is found in the New Testament, but the creeds are not the word of God. What, then, does sola scriptura mean? It means that Scripture is the only publicly accessible, infallible verbal expression of God’s truth in the world. There are all sorts of fine expressions of God’s truth, but the only verbal expression of God’s truth in the world that is publicly accessible and infallible is God’s word in Scripture. The sacraments are wonderful expressions of the gospel but they are non-verbal (though there are verbal elements in the liturgy that are generally taken from Scripture). Private promptings of the Holy Spirit to individuals are expressions of God’s truth but they are not publicly accessible. Creeds are publicly accessible, verbal expressions of God’s truth, but they are not infallible—that is, they are not guaranteed to be unfailingly true because they are not God’s word. Infallible means more than “true”; it means that what is said cannot fail to be true, or that it cannot be false in any way. A creed can be “true” without being infallible; it can be reliable without being unimpeachable. The church is free to rewrite and expand its creeds, as the early church did when it expanded the Apostles Creed into the Nicene Creed in 325 and then expanded the Nicene Creed into the Niceno-Constantinopolitan Creed in 381. The church is not, however, free to rewrite and expand the Bible. This is because creeds, as wonderful as they are, are merely the words of men, whereas the Bible is the word of God. The basis of sola scriptura is that only Scripture is the written word of God available to us today. The meaning of sola scriptura is that only Scripture is a publicly accessible, infallible verbal expression of God’s truth available today. What, then, is the significance of sola scriptura? Its significance is that only Scripture is the infallible rule of doctrine and practice for Christians today. If Scripture is the only infallible verbal expression of God’s truth available to Christians today, then it follows that Scripture is the only infallible rule of doctrine and practice for Christians today. This means that only those truths about God and our saving relationship with him, which Scripture clearly teaches or that follow from the teaching of Scripture, may be required of Christians to believe. Non-Protestants constantly argue that this conclusion is not itself taught in Scripture and therefore is self-defeating. If Scripture does not teach sola scriptura, so the argument goes, then sola scriptura cannot be true. Not a few Protestants have been misled into accepting this reasoning and consequently have left Protestantism for some other form of Christianity, whether Roman Catholicism, Orthodoxy, or even a heretical group such as the Mormon religion. This argument against sola scriptura is quite flawed because in fact the doctrine does follow from what Scripture clearly teaches. Scripture clearly claims infallible authority for itself and just as clearly denies infallible authority to any other verbal communication accessible to us today. I have already summarized the scriptural basis for saying that Scripture is the only written word of God. I have also summarized the scriptural basis for saying that apostles and prophets were temporary ministries of the foundational period of the church and that without such figures we do not have any other infallible verbal communication of truth from God that can function as a standard or rule for Christians today. This is really the whole basis of the doctrine of sola scriptura, and it comes straight from Scripture itself. Of course, while the apostles were still alive, they expected Christians to treat their oral teaching as equally authoritative to their written teaching. In this respect, the first-generation church’s infallible rule was not limited to Scripture, a fact that non-Protestants take out of historical context to exploit as an argument against sola scriptura. But we see the apostles themselves in the later NT writings pointing the way as the church was about to make the transition from the apostolic era to the post-apostolic era. We can see this in the final epistles written by three of the apostles: Paul, Peter, and Jude. Pau’s final epistle was 2 Timothy. In this epistle, Paul tells Timothy in 2 Timothy 2:2 to pass on his teaching to faithful men who will be able to teach others also. The church and its leaders are therefore part of the picture; again, we are not denying the importance of the church and its role in transmitting the gospel from one generation to the next. But Paul does not say anything to suggest that this transmission process would be infallible. There were false teachers within the church even in Paul’s day, as he points out later in the same chapter. Paul goes on to acknowledge that after his departure difficult times were coming when many people would profess Christian faith but lack its reality, and some would teach myths instead of the truth. It is in this context that Paul affirms that all Scripture is inspired by God and that what it teaches will prepare the man of God to do all God calls him to do (2 Tim. 3:16-17). Faithful—not infallible—men would be adequately and sufficiently prepared to continue maintaining the faith as they are taught to know and believe and teach the Scriptures. In 2 Peter, the apostle Peter recognizes that his life is coming to an end and that the church is going to be assaulted by false teachers. His instruction for standing firm against such teachers is to “remember the words previously spoken by the holy prophets and the commandment of our Lord and Savior through your apostles” (3:2). The true faith will be maintained not by submitting without question to the bishops or creeds but by remembering what God said in the past through the prophets and the apostles of Christ. We have those words preserved for us in the Old and New Testaments, and nowhere else. Jude makes a similar point in his epistle. After urging his readers in verse 3 to contend for the faith once for all delivered to the saints, he tells them how to do that in verses 17-21: remember the words of the apostles of Christ, build themselves up in the faith, pray in the Holy Spirit, and keep themselves in the love of God. There is not one word here about looking to an infallible Church to be the unquestioned rule of doctrine and practice. The doctrine of sola scriptura is itself scripturally based. It follows from the unique character of Scripture as the only available verbal word of God for the church today. We must test all teachings, creeds, confessions, and opinions by Scripture because it alone is the infallible word of God for the church today. Evangelicals do not view the church fathers or medieval theologians as authoritative in matters of Christian doctrine. However, since Catholic and Orthodox Christians often claim that the doctrine of sola scriptura is a modern evangelical innovation, we should take notice of what some famous Christian teachers have said on the subject in the past. What follows are just a very small sampling of such statements—enough to establish that sola scriptura has significant precedent in church history. If, however, we cannot discover explanations of all those things in Scripture which are made the subject of investigation, yet let us not on that account seek after any other God besides Him who really exists. For this is the very greatest impiety. We should leave things of that nature to God who created us, being most properly assured that the Scriptures are indeed perfect, since they were spoken by the Word of God and His Spirit; but we, inasmuch as we are inferior to, and later in existence than, the Word of God and His Spirit, are on that very account destitute of the knowledge of His mysteries.—Irenaeus, Against Heresies 2.28.2. …it is to the canonical Scriptures alone that I am bound to yield such implicit subjection as to follow their teaching, without admitting the slightest suspicion that in them any mistake or any statement intended to mislead could find a place (Letters 82.3). …there is a distinct boundary line separating all productions subsequent to apostolic times from the authoritative canonical books of the Old and New Testaments…. In the innumerable books that have been written latterly we may sometimes find the same truth as Scripture, but there is not the same authority. Scripture has a sacredness peculiar to itself (Reply to Faustus 11.5). We believe the prophets and apostles because the Lord has been their witness by performing miracles…. And we believe the successors of the apostles and prophets only in so far as they tell us those things which the apostles and prophets have left in their writings (De veritate, 14.10, ad 11). …only the canonical Scriptures are normative for faith. Whereas others who write about the truth do so in such a way that they do not want to be believed unless what they affirm is true (Comm. on John 21, lect. 6). ….only to those books or writings which are called canonical have I learnt to pay such honour that I firmly believe that none of their authors have erred in composing them (Summa theologiae, 1a.1.8). Critics of evangelical Christianity have voiced numerous objections to the doctrine of sola scriptura. It will be helpful to look at a few of the most common such objections. Objection: The doctrine of sola scriptura is self-defeating because it is not taught in Scripture. Answer: Actually, it is taught in Scripture, since (as explained above) Scripture teaches that Scripture is an infallible source and standard for Christian doctrine and denies infallibility to other sources (such as human traditions and religious leaders). Objection: Sola scriptura is false because Scripture is not the only or even the most important Word of God; Jesus Christ is the living Word of God and is therefore the Word of God in the ultimate and most important sense. Objection: Protestants don’t really use the Bible alone, because they appeal to church traditions where it seems to support their beliefs. Answer: Protestants don’t claim that Christians may only use the Bible alone but that it alone is an unquestionable, unimpeachable, infallible authority for Christian faith and practice. Objection: The sola scriptura principle cannot be of God because it has given rise to over 20,000 denominations disagreeing among themselves about what Scripture teaches. Answer: The raw number of denominations is misleading (many are simply regional organizations within the same denomination; many denominations are liberal or heretical sects that reject sola scriptura; etc. ), but in any case the problem is not sola scriptura but human fallibility and sin. If church tradition was sufficient to preserve Christian unity, there would not be Roman Catholic and Eastern Orthodox churches, both claiming to be the guardians of that unity. The claim that sola scriptura is at fault needs to be shown by more than a post hoc propter hoc fallacious argument. Objection: When the NT refers to Scripture, as in 2 Timothy 3:16, it is referring to the OT, so if such texts prove that only Scripture is an infallible authority for the church then they would exclude the NT. Answer: The fact that in many places in the NT the term Scripture refers in context to the OT does not disprove that what it says about the authority of the OT does not also apply to the NT. If one accepts the NT as being just as much Scripture as the OT, one cannot deny to the NT the authority that the NT accords to the OT. That the limits of Scripture were in the process of being expanded in the first century to include the NT writings does not warrant the claim that doctrinal sources outside the parameters of Scripture also carry the same authority as Scripture. Here’s an illustration of the principle here: A school policy statement published in 2011 requires students to follow the instructions of all school employees during a fire alarm. In 2012 the school hires ten new employees. The policy extends to include those new employees but not to include other adults not mentioned in the policy, such as parents of other children. Objection: 2 Timothy 3:16 cannot support sola scriptura because in the same chapter Paul uses a non-biblical oral tradition when he gives the names Jannes and Jambres for two of the Egyptian magicians in the Book of Exodus (2 Tim. 3:8). Answer: The doctrine of sola scriptura does not deny that extracanonical sources can be useful but rather than such sources are not guaranteed to be infallible, as Scripture is. The same answer applies to other NT citations of extracanonical sources. It also applies to the question of why Protestants publish study Bibles, systematic theologies, and other books of instruction. Objection: Scripture provides no list of the writings that belong in the canon; therefore, Scripture is not sufficient to establish the doctrine of the canon of Scripture. Answer: Tradition also provides no list of the traditions that are infallible; therefore, by this reasoning, tradition is not sufficient to establish the doctrine of the sufficiency of Scripture plus tradition (plus whatever else one wants to add). Tradition clearly did not have infallible information on this subject because the church discussed and debated the precise extent of the NT canon for a century. The objection is fallacious because it assumes a sufficient source of information on the canon must take the form of a list. Scripture can inform us as to what makes a book authoritatively from God without giving us a list of approved books. Objection: God may have inspired writings in the past to which we no longer have access. For example, we don’t have all of Paul’s letters to the Corinthians. Barrett, Matthew. God’s Word Alone—The Authority of Scripture: What the Reformers Taught...and Why It Still Matters. 5 Solas Series. Grand Rapids: Zondervan, 2016. Lillback, Peter A., and Richard B. Gaffin, eds. Thy Word Is Still Truth: Essential Writings on the Doctrine of Scripture from the Reformation to Today. Phillipsburg, NJ: P&R, 2013. Mathison, Keith A. The Shape of Sola Scriptura. Moscow, ID: Canon Press, 2001. One of the best defenses of the evangelical doctrine. Putman, Rhyne R. In Defense of Doctrine: Evangelicalism, Theology, and Scripture. Minneapolis: Fortress Press, 2015. Sproul, R. C. Scripture Alone: The Evangelical Doctrine. Phillipsburg, NJ: P&R, 2005. 1. This definition is verbally almost identical to the one given by evangelical teacher Michael Patton: “Sola Scriptura: the belief that the Scripture alone is the final and only infallible source for matters of faith and practice.” See “The Danger of Sola Scriptura,” Bible.org, Oct. 3, 2005. 2. Catechism of the Catholic Church 105-107. 3. John Anthony McGuckin, The Orthodox Church: An Introduction to Its History, Doctrine, and Spiritual Culture (Malden, MA: Wiley-Blackwell, 2008), 101. 4. Robert M. Bowman Jr., “Is Scripture without Error? The Bottom-Line Guide to the Bible, Part 5 (Cedar Springs, MI: Institute for Religious Research, 2015). 5. Robert M. Bowman Jr., “Why Do You Believe the Creeds Instead of the Bible?” (Cedar Springs, MI: Institute for Religious Research, 2014). 6. See Robert M. Bowman Jr., “Prophets Today? Prophets in the Bible and in the LDS Church,” Gospel Principles and the Bible (Cedar Springs, MI: Institute for Religious Research, 2011). 7. Stephen Wellum, Christ Alone—The Uniqueness of Jesus as Savior: What the Reformers Taught…and Why It Still Matters, Five Solas Series (Grand Rapids: Zondervan, 2017). 8. See further Robert M. Bowman Jr., “The Canon of the Bible and the LDS Standard Works,” Why Christianity Is True but Mormonism Is Not, Part 5 (Cedar Springs, MI: Institute for Religious Research, 2016), and the additional articles listed there.